A Taigen turret rotation gear ring for all Taigen tanks (except TAG13005/13006 King Tiger and new Taigen Leopard 2A6). Offered here are two types of rotation rings, the stock 270 degree and our new 360 degree rings. Please make sure to match your gear ring with the one on your tank, not doing so can cause wiring issues. Please read below for explanations on what type to get. 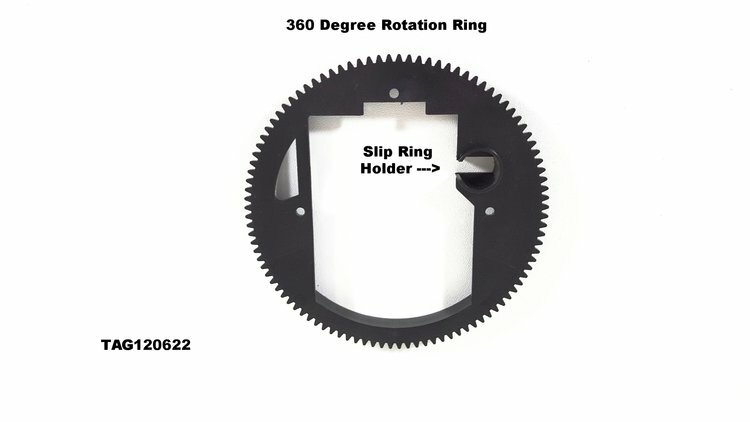 270 Degree Rotation - The 270 degree rotation gear rings are for the Taigen Tanks not equipped with our 360 degree slip ring kits (TAG120625-TAG120628) and have a built in stop to limit the rotation to about 270 degrees. The limitation is built into the gear ring to prevent the wiring from tangling during rotation. 360 Degree Rotation - The 360 degree rotation gear rings are for the Taigen Tanks equipped with our 360 degree slip ring kits (TAG120625-TAG120628). These tanks have a slip ring built into the wiring that allows unlimited rotation without tangling the wiring.